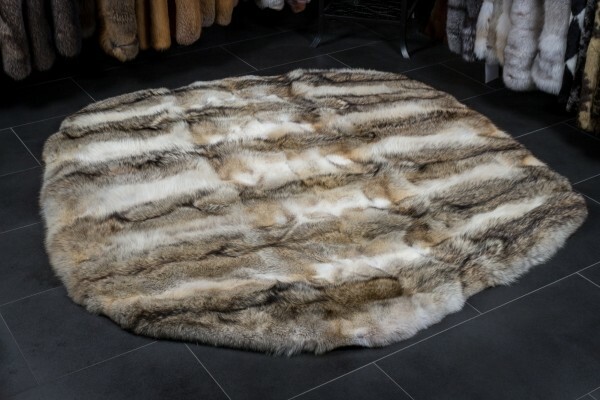 This round Canadian coyote fur carpet was made with natural Coyotes. The rustic look of the coyote fur rug goes particularly well with the country house style and similarly furnished interiors. This beautiful floor covering is crafted entirely from durable 100% real fur so that you can enjoy natural materials at your home. Contemporary natural design and tones will complement any existing decor. The hair of the coyotes is pleasantly warm and supple. Our master furriers and tailors made this fur carpet in our workshop in Kiel, Germany. If you have questions or suggestions, you can always contact us. Related links to "Canadian Coyote Fur Carpet - Round Shape"
Customer reviews for "Canadian Coyote Fur Carpet - Round Shape"